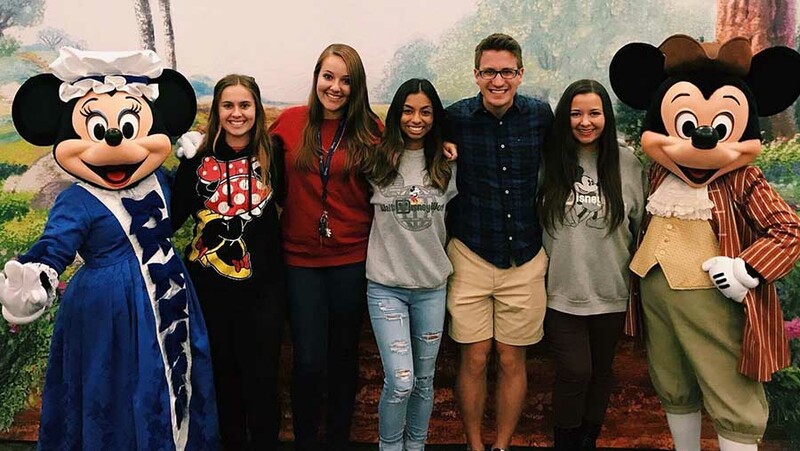 In August 2017, William Blue Hospitality Management scholarship student Georgina embarked on the journey of a lifetime; moving to Florida to join the Disney International College Program. Fast-forward three months and Georgina has returned home to Sydney with a whole new outlook on life. We sat down with Georgina to talk all things Disney, life in the USA, and what her next adventure will be. So Georgina, how long has it been since you returned home? How have you found adjusting to life back home? It’s been three weeks since I returned home from Florida. However, my Disney journey finished up a little while back. After farewelling my college family, I embarked on a month of travel around America with a few of my friends. It was an amazing trip, and really, the perfect end to an incredible six months. Adjusting to life back home has been a little challenging, as I have jumped right back into study and working a new job. It’s great to be back home though with all my family and friends. Looking back on your time spent at the Disney Program, what were the highlights? The best part of work itself had to be that no week was the same. I think my experience was unique in that my role enabled me to work outside of the park and inside. Working both allowed me to get involved in all components of the park’s operations, building various skills that I could apply in any part of the park; which meant that I was able to fine-tune the “Disney way” of service. Honestly, overall, the program had so many highlights that indeed it was the highlight of my life to date. I got to live out my dream job, meet people from all over the world, and I have returned home with a new outlook on life and friendships that will last a lifetime. Before embarking on your Disney journey, you would have had expectations for what living overseas and being in the program would be like. Looking back now, can you say your expectations were met? I definitely knew I would be having more of an independent life. This was one of the aspects that I was most excited about. It was the first time I would be living in my own apartment, and weirdly enough, I loved the responsibilities that I had. In regards to the workplace, the initial training was a little more overwhelming than I had expected. The training that my role required was quite complicated and by the fifth day of theory training, I was honestly ready to cry! It was challenging to get my head around all the new information but I was grateful for the American program participants in my class who shared their incredible knowledge developed from visiting the parks since they were young. When looking back at my experience, it’s great to be able to reflect on my progression through the program. Yes, I did start out as an excited, overwhelmed international participant with no real idea of what I was getting myself into. But, I came out of it not only as a successful graduate of the program but as a stronger person with a newfound sense of independence. Last time we spoke you mentioned how working at Disney was something you had always strived for and that you were eager to learn the “Disney way”. As an individual in the hospitality industry, did the “Disney way” help shape you and influence your work ethic? Having insight into Disney’s world-renowned guest service has definitely helped me capture why Disney Land really is “The Happiest Place on Earth”. Disney focuses on the happiness of their guests, and as a cast member, you are given the control to create that happiness. This control permits you to step out of your normal duties and be trusted to make “magical moments” for your guests. Disney doesn’t see anything as a cost to the company if the sole intentions of the action are to make the guest happy. This can be anything from replacing food and beverages, to room upgrades, or even providing children with complimentary ride tickets. Disney really has taught me a whole new philosophy on the guest experience. They have shaped how I approach any situation and provided me with a whole new perspective when it comes to creating happiness for guests. Moving forward, these teachings will allow me to get involved in creating emotional connections for guests, to create memorable experiences. What lies next for you this year? This year I have returned to William Blue to complete my Bachelor of Business in Hospitality Management. I was also lucky enough to be offered the position of Executive Lounge Attendant at the Four Seasons in Sydney. While I adored my time at Disney, the one thing I did miss was the aspect of being able to take care of guests and form a relationship with them post-check-in. I was able to attend to hundreds of guests each day at Disney and not being able to see them again after meeting them was hard. That is one of the things that I love about working in a hotel; having the opportunity to attend to a guest’s needs throughout their whole stay, from check in to check out. It’s of course still early days, so I am excited to see what 2018 has in store for me, and I can’t wait to take on each opportunity as it comes. “Disney has taught me a whole new philosophy on the guest experience. They have shaped how I approach any situation and provided me with a whole new perspective when it comes to creating happiness for guests. Moving forward, these teachings will allow me to get involved in creating emotional connections for guests, to create memorable experiences. If you were to provide some advice to William Blue students looking to embark on the Disney International College Program, what would it be? Don’t look at overseas placement as something that is an unachievable feat because it isn’t. Seriously consider it and dream big! Start researching what is on offer early on, and gain an idea of where you could see yourself working and living. Having the opportunity to work overseas is something that doesn’t come along every day so take it while you can! This program was something I had wanted to do for a very long time. It was a dream of mine, and I am so glad that I followed through with it and made the dream my reality. Get out of your comfort zone, and do something different! Nothing is ever too crazy, and when you look back on your achievements, you’ll have memories that you can hold close to your heart for the rest of your life.